Babies, toddlers, preschoolers, and big kids all love Tiny Toes Music! 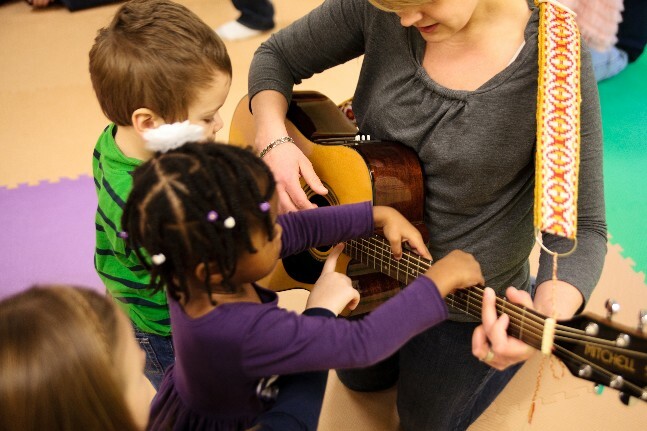 Our playful music classes for kids support every child, no matter their age, learning style, or stage of development. Each weekly class includes lots of songs and music activities especially created for young children, led by trained teachers who inspire everyone to join in the fun. Our classes are a great family activity; in fact many grownups find they have just as much fun in class as the kids. Leave your adult cares at the door and bring your inner child with you to play. You will love it! Zion ECEC- Benefit Concert With Uncle Gerry! Quarterly e-newsletter from Music Together Worldwide and access to the Family Music Zone including bonus songs, videos, coloring sheets, and more! Mix it up with our seasonal three week classes! Payment is due at the time of registration. You will receive confirmation of your enrollment by email. Refunds are not available after the first class, but make-ups can be arranged based on availability. In the event that a registration cancellation or change is requested more than 48 hours prior to the first class, you will receive a full refund, less a 10% processing fee. We reserve the right to make changes to the class schedule.